Have you made plans for Valentine’s Day yet? We have! So we’re super excited to share the details from our latest Valentine’s Day Party in a Box. The best part about this Valentine’s Day Party Box? We make it so easy to set up! In the box you’ll find a stunning collection of tableware and decor that we hand picked to make the perfect party. Whether you’re inviting your besties over for cake + cocktails, having your kids friends over for a festive playdate or inviting your family over for brunch, we’ve got you covered. 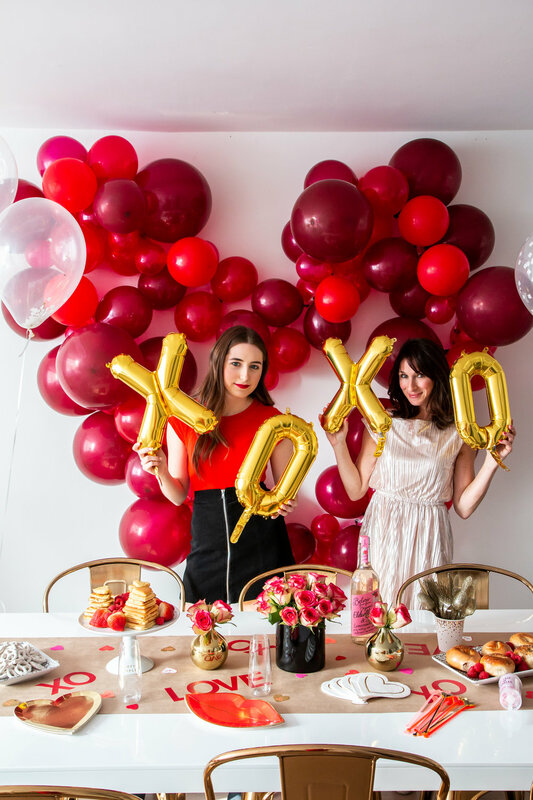 This Valentine’s Day we included XOXO balloons that you can fill with air so you can string them into a garland or tape them to the wall as well as the most adorable plates, metallic confetti cups, heart shaped napkins, confetti and gorgeous stir sticks that can double as cake (or pancake!) toppers. This Valentine’s Day I’m hosting my family for a brunch. To make the party extra festive I served pancakes shaped as hearts (pour the batter into heart shaped cookie cutters), mini bagels with strawberry cream cheese and tons of red fruit. I found a sparkling lemonade that I served with orange juice, coffee and prosecco. I find that in New York, roses tend to be pretty inexpensive so I picked up a bunch to add some extra color to my table. If you want to go the extra mile like we do you can add a balloon garland to the wall. Maggie made a kill red balloon garland and shaped it into a heart. These garlands may tend to look overwhelming to make yourself but they are not. Want to give it a try? Find our Balloon Garland DIY here. So what are you waiting for? 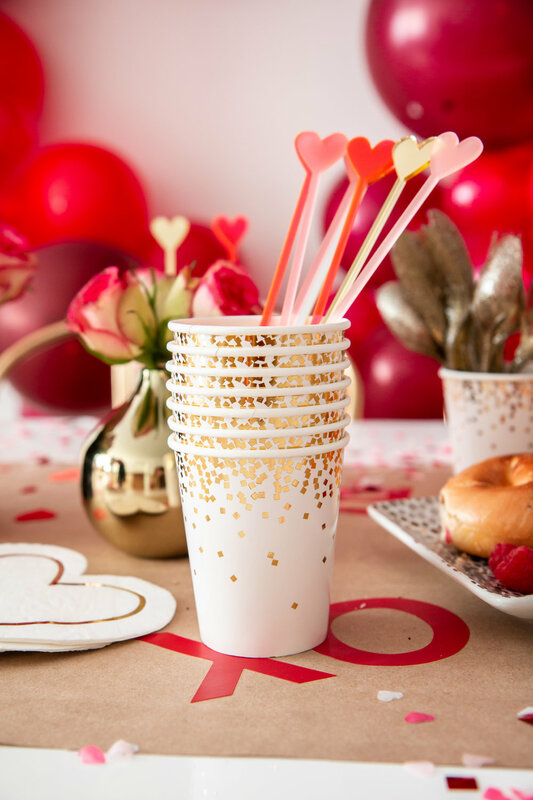 Join the party and get yourself a Valentine’s Day Party in a Box here. Have fun this Valentine’s Day! We hope you spend it with the people you love.